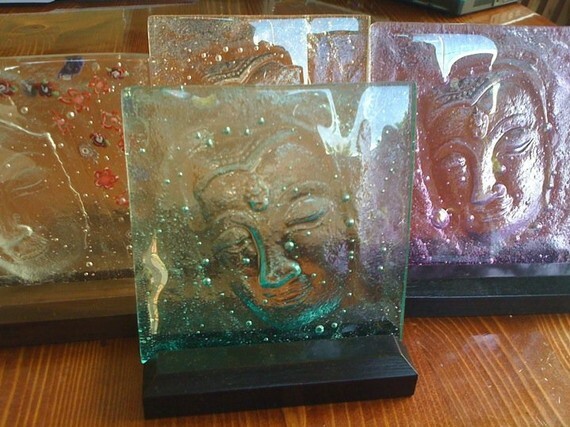 Cheryl Merz creates fine art work, household goods and beautiful jewelry in kiln formed glass. Kiln formed glass is made just as it's stated, formed in a kiln. This is different from the commonly known artistry of blown glass in that the hot work is done inside the kiln instead of working with the glass in a molten state. Kiln forming is common for everything from creating thick sculptural art to jewelry to dinnerware and even furniture. A great deal of preparation is required for kiln formed glass as there is very little interaction with the firing once the glass and molds are placed in the kiln. Prep work can take up to ten times as long as any firing, which alone is never less than 20 hours and can last for days. Mold making often begins with a clay model, or real parts like hands or faces, and goes through two or three more stages of alginate, silicone, and plaster before it is ready to form a final piece of glass. My wish is that you gain pleasure from and appreciation for the glass you see around you. Whether you buy it from me, admire in a gallery or create for yourself. All artwork shown is a sampling of the many creations available ~ custom color schemes & designs can be created to suit your personal taste and decor. If we have Lived, our Hearts have been lifted, loved, dropped, separated, expanded, given away, reclaimed, and reignited. The pieces, once touched, cared for, abandoned, scattered, and shared are then fused back together by our Spirit, Love for life, Connection with each other, and the continued Passion to give and share on this journey. Whole-Hearted is a series of unique kiln-cast glass sculptures. Inspired by the beauty, diversity, and vast possibility of piles of scarp and discarded shards of glass, the Artist reminds us that there is potential for beauty and love in everything that we see. Whole-Hearted Memorial pieces are also available. With a tiny bit of your loved one's cre-mains, the glass and ash dance in their own inspired creation to bring a one-of-a-kind symbol of enduring love as beautiful decor. 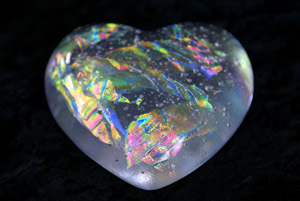 Each heart is 3.5 inches in diameter and can be customized to any color/combination you choose. and runs til December 8th. Come out and start your holiday shopping! Whole Hearted Sculpture ~ 3.5 inches in diameter and Says "I love you Mom" every time she sees it! Click here to MESSAGE Cheryl to order Today!